Shalosh B. Ekhad, the co-author of several papers in respected mathematics journals, has been known to prove with a single, succinct utterance theorems and identities that previously required pages of mathematical reasoning. Last year, when asked to evaluate a formula for the number of integer triangles with a given perimeter, Ekhad performed 37 calculations in less than a second and delivered the verdict: "True." Shalosh B. Ekhad is a computer. Or, rather, it is any of a rotating cast of computers used by the mathematician Doron Zeilberger, from the Dell in his New Jersey office to a supercomputer whose services he occasionally enlists in Austria. The name - Hebrew for "three B one" - refers to the AT&T 3B1, Ekhad's earliest incarnation. 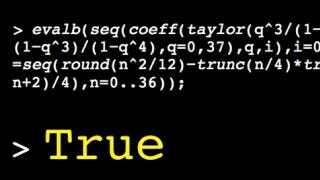 "The soul is the software," said Zeilberger, who writes his own code using a popular math programming tool called Maple. A mustachioed, 62-year-old professor at Rutgers University, Zeilberger has been listing Ekhad as a co-author on papers since the late 1980s "to make a statement that computers should get credit where credit is due." For decades, he has railed against "human-centric bigotry" by mathematicians: a preference for pencil-and-paper proofs that Zeilberger claims has stymied progress in the field. "For good reason," he said. "People feel they will be out of business." Anyone who relies on calculators or spreadsheets might be surprised to learn that mathematicians have not universally embraced computers. To many in the field, programming a machine to prove a triangle identity - or to solve problems that have yet to be cracked by hand - moves the goalposts of a beloved 3,000-year-old game. While Ekhad may represent the future of mathematics, there are still plenty of humans working in the field — and they aren't so sure that we should trust often-buggy computer programs to do our math. Wolchover explores the ways that computers are changing the way we describe the world (and sometimes hypothetical worlds) with math. What's fascinating is that the integration of computers into the world of math is less as tools but — as the example of Zeilberger's work makes clear — as researchers. Software can puzzle out problems that once only humans did, and they can check the truth of proofs more quickly than any human could in a lifetime. Computers, Wolchover points out, now regularly beat grandmasters in chess. Like that game, mathematics is an area where computers can sometimes best their human counterparts. That makes math departments into places where computers may, oddly, be treated more like people than anywhere else.